Exercise should be an essential part of the daily routine during pregnancy unless there is any medical reason not to do so. Exercise during pregnancy improves general health, vitality, and wellbeing, and reduces stress. This also prevents certain pregnancy complications. This article discusses the benefits and safety of physical activity during pregnancy. Is a sedentary lifestyle better in pregnancy rather than staying active? Historically women were discouraged to exercise during pregnancy. They were encouraged to maintain a sedentary habit. Many people (including some healthcare professionals) feared over the years that physical activity could be harmful during pregnancy. There is no scientific evidence to show that a sedentary lifestyle during pregnancy is beneficial (unless there are some pregnancy complications where reduced physical activity is advised). In fact, sedentary habits could predispose to as excessive weight gain and pregnancy complications, such as deep vein thrombosis. Excess weight gain, in turn, could increase the risk of gestational diabetes and preeclampsia. Therefore, all the renowned professional bodies (from all across the world) recommends pregnant women (without certain medical complications) to stay active and undertake physical exercises during pregnancy (even if they were not active physically before pregnancy). Can you exercise while you are pregnant? Yes, you certainly can. Scientists have proven that exercise during pregnancy is safe if suitable activity and intensity are chosen. There is no scientific evidence to suggest that moderate exercises can be harmful to the pregnant woman and her baby. Moderate exercise during pregnancy does not increase the risk of miscarriage, preterm birth (early delivery) or low birth weight babies (intra-uterine growth restrictions). Pregnancy is a wonderful opportunity and motivation to adopt a healthy lifestyle. Therefore, you certainly can start doing regular exercise if you have not done so in the past (unless there are certain medical conditions). What are the conditions where exercises during pregnancy should be avoided? 1) Some heart and lungs diseases/ conditions. 2) If she has a cervical cerclage or at risk of miscarriage due to cervical incompetence. 3) Low-lying placenta (Placenta Previa), especially after 26 weeks of pregnancy. 4) Premature rupture of membranes (leaking of amniotic fluid) or risk/ symptoms of pre-term labour. 6) Raised blood pressure/ Preeclampsia. 7) Women with Twin/ triplets pregnancies (or higher order multiple pregnancies) with the risk of pre-term labour. Also, pregnant women with fever should avoid exercise due to the risk of fetal hyperthermia. 1. Evidence of fetal growth restrictions or at high risk of developing fetal growth restrictions. 2. Women at high risk of miscarriage. 3. Women at high risk of preterm labour. Exercise helps in both preventing gestational diabetes. This also improves blood sugar control in women with gestational diabetes. Exercise reduces the risk of developing preeclampsia and gestational hypertension. Cardiorespiratory Fitness (CRF) is the body’s ability to supply oxygen to muscles during prolonged physical activity. The body does through effective functions of the heart (cardiac) and lungs (respiratory). VO2 Max is the measurement of CRF of the individual. VO2 Max refers to the highest amount of oxygen a person can consume during physical exercise. Exercise during pregnancy improves CRF which helps in the better adaptation of the body to the normal physiological changes and in labour. Exercise also improves other bodily functions, such as muscular strength and endurance, flexibility, agility, coordination, balance, reaction time, and speed. Excess weight gain during pregnancy increases the risk of gestational diabetes, preeclampsia, and other medical complications. Exercise and adherence to a healthy diet prevent the excessive weight gain. Exercise during pregnancy improves mood, psychological wellbeing and depression symptoms. Mind-body interventions, such as yoga, are known to reduce stress. Pelvic Floor exercises, performed regularly, prevents/ improves urinary incontinences both during pregnancy and after the childbirth. Exercise is thought to help with sleep and prevents insomnia. However, strenuous exercise in the evening could lead to sleep disturbance/ insomnia at night, so should be avoided. There is some evidence to suggest that exercise during pregnancy could help in back pain. 9) Helps to reduce weight (gained during pregnancy) after the childbirth. 10) May reduce the risk of a Caesarean birth. Considering the above benefits, it is advisable to exercise during pregnancy and stay physically active, unless there are medical reasons not to do so. What kinds of exercises are safe during pregnancy? What type of physical activity is recommended during pregnancy? It is advisable that every reasonable opportunity should be taken to be active throughout the day. Prolonged sitting should be avoided. It is important to remember that every physical activity counts. Light physical activities (such as light household chores and cooking) does not count towards the recommended exercise routine during pregnancy. But they are key to staying active and break the cycle of the sedentary lifestyle. – Beginning with a warm-up, muscle-strengthening exercise/ stretching for 5 – 10 minutes. – This is followed by rest and cooling down period for about 5 – 10 minutes. The word ‘Aerobic’ means ‘involving oxygen’. Aerobic exercise (also called ‘cardio’) refers to physical activities taken to improve the efficiency of the body in utilising oxygen in the formation of energy. Aerobic exercises usually involve moving large muscles of the body (such as legs and arms) at a moderate intensity to increase the heart and breathing rates. These exercises ensure that the body utilises a process called aerobic metabolism. Aerobic exercises involve oxygen supply to break down glucose to produce the basic energy molecules of the cells called ATP (Adenosine Triphosphate). During exercise or any physical activity, the muscles require energy. The energy of the muscle cells comes from a molecule called ATP (Adenosine Triphosphate). ATP has a short half-life, therefore cannot be stored within the muscle cells for long. Therefore, ATP needs to be produced constantly (within the muscle cells) from glucose during the entire exercise session. 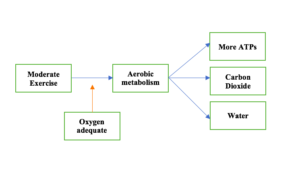 Aerobic metabolism requires oxygen. 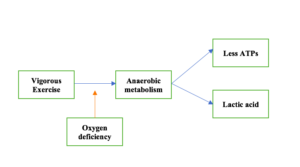 Anaerobic metabolism can produce ATP without oxygen. Aerobic is the most efficient form of metabolism, compared to the anaerobic variety. For example, 1 molecule of glucose produces 38 molecules of ATP in aerobic metabolism. On the other hand, during anaerobic metabolism, only 2 molecules of ATP are produced. During exercise, the breathing rate increases. This ensures a high amount of oxygen available to the muscle cells. If the oxygen level is adequate, the aerobic metabolism is activated. During this process, a high amount of ATP is produced, along with water and carbon dioxide. The by-products of the aerobic metabolism (i.e., carbon dioxide and water) are easier to excrete from the body. For example, carbon dioxide is easily excreted through the lungs during the high breathing rate at the time of exercise. This excretion does not require any further oxygen. However, when the exercise continues (or intensity is increased), the tissue oxygen level is no longer remains enough for the aerobic metabolism (in spite of the high breathing rate). In this circumstances, to ensure a continuous supply of ATPs, the anaerobic metabolism is activated within the muscle cells. During the anaerobic metabolism, less ATP is produced (compared to the aerobic metabolism). Also, the by-product of the anaerobic process is lactic acid. The lactic acid causes pain, soreness, and fatigue in the muscles. Moreover, the lactic acid is only broken down and excreted from the body with the help of oxygen. Therefore, the body needs to stop the exercise and take some rest to replenish the oxygen level. Therefore, after a strenuous workout, we need to take rest to recover. During the pregnancy, the energy demand of the tissues is more in the same type and intensity of the aerobic exercise. This is due to increase in body weight, blood volume, requirements of the placenta and the growing baby. Therefore, non-weight-bearing exercises are better performed during pregnancy compared to the weight-bearing ones. With the practice of regular aerobic exercise, the Cardiorespiratory Fitness (CRF) of the body improves. Then the muscles can utilise oxygen better and can delay the anaerobic process longer with higher intensity exercises. Which aerobic exercises are safe during pregnancy? Which exercises are best for a pregnant woman? The low impact exercise refers to all the physical activities where at least one foot is always in touch with the ground. During the low impact exercises, there is a reduced risk of fall and injury to the pregnant woman. I was never been active before pregnancy. Can I start doing exercises during pregnancy? Yes, of course, you can make a start unless you have certain medical conditions (mentioned above). However, if you are starting exercises for the first time, you are advised to start gradually. This would allow your body to get used to the changes to build better exercise tolerance. You should, however, not start performing vigorous/ high-intensity exercise and heavy-weight training during pregnancy, if you have not done them before pregnancy. I would like to start to exercise. Which month to start exercise during pregnancy? Is it safe to perform vigorous/ high-intensity exercises during pregnancy? Can you still go to the gym while pregnant? It is generally agreed that the pregnant women who have been doing high-intensity exercises before the pregnancy may continue them during pregnancy with some adaptations (so long they do not have/ develop any medical complication). However, there is very limited scientific evidence available on the impacts of intense physical activity during pregnancy. If you are already doing high intensity/ high impact exercises before pregnancy (and would like to continue), please speak with your Obstetrician, midwife, the health care provider, your Trainer or a sports medicine specialist at the earliest. It is advisable that you consider modifying high-intensity workouts as the pregnancy advances. Moreover, vigorous workouts often involve high impact exercises (i.e., during these exercises, both feet are off the ground at the same time). The examples of the high impact exercises include jogging, sprinting, aerobic dancing (such as Zumba), jumping, skipping etc. There is a high risk of fall and an accidental trauma to the abdomen (during the high impact exercises). Vigorous/ high impact exercises should be avoided for the beginners during pregnancy. Is it ok to jog in early pregnancy? Jogging is a high impact and high-intensity exercise. If you have been jogging for sometimes before pregnancy, you may wish to continue. This is usually considered safe unless you have certain medical conditions (where reduced physical activity is advisable). However, as with other high impact exercises, the research data is limited. Therefore, it is advisable to speak with your Obstetrician, midwife, the health care provider, your Trainer or a sports medicine specialist at the earliest. Can you get a miscarriage from running? Can running while pregnant hurt the baby? Running/ jogging are high-impact and high-intensity exercises. They are usually considered safe during pregnancy if you are already doing them prior to the pregnancy. The safety data on the practice of high-intensity exercise during pregnancy is limited. 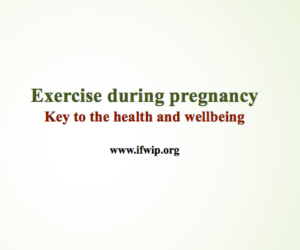 Therefore, it is advisable to avoid running/ jogging or similar high-impact and high-intensity exercises during pregnancy if you have risk factors for miscarriage or preterm labour. They are not recommended to be started during pregnancy if you have not done them before pregnancy. Can I still do Zumba while pregnant? Zumba is a high-impact and high-intensity exercise. Therefore, all the advice similar to running/ jogging (as above) apply to the Zumba too. Is it safe to do squats while pregnant? This is a commonly advised exercise for the mothers-to-be. It is safe to perform squats unless there are certain medical conditions (mentioned above where reduced physical activity is advised). However, it could be challenging as the pregnancy advances or if you have pelvic girdle pain/ backache. Therefore, please ensure that you are comfortable during squats. Can you do sit-ups in early pregnancy? If you have been doing sit-ups before pregnancy, you may wish to continue in the first trimester. However, exercises in the supine (lying flat) is not advisable after the first trimester (especially after 16 weeks of pregnancy). Therefore, it would be better to discontinue after the first trimester. If you wish to carry on, then speak to your healthcare providers. Is it safe to perform exercises during pregnancy in the water? – Little concern with the loss of balance and fall. – Less concern for hyperthermia, as the heat can dissipate easily. – Less impact and risk of injury to the weight-bearing joints. What are muscle strengthening exercises? These exercises involve moving the muscles against a resistance. The resistance can be one’s own weight, machines or weight tools. Muscle strengthening exercises are not aerobic exercises. So they should be done in addition to the aerobic exercises during pregnancy. ‘Repetitions’ and ‘Sets’ are the two terms used to count the muscle strengthening exercises. The ‘Repetition’ refers to one complete movement of an activity, whereas a ‘Set’ is a group of those ‘Repetitions’. Yoga, Pilates, and weight training are examples of muscle strengthening exercises. Pregnancy yoga and pregnancy pilates are safe forms of exercises during pregnancy (when undertaken under the supervision of a trained and qualified instructor). Difficult yoga/ pilates postures/ positions are to be avoided to avoid loss of balance and injury to the belly. Exercises in the supine position (lying flat on the floor) are also not advisable to avoid the postural drop of blood pressure (postural hypotension). This reduces blood flow to the brain (can result in fainting episode) and uterus/ placenta (can result in fetal compromise). However, caution needs to be taken for the weight training during exercise. Is it safe to perform weight training during pregnancy? Weight training may be performed during pregnancy. However, there is very limited information on its’ safety. Therefore, an individualised approach is necessary for every single pregnant woman who is keen to perform the weight training. It would be advisable to discuss such workouts with health care providers, training instructors and/ or a sports medicine specialist. In absence of good scientific evidence on safety, it might be useful to consider alternative muscle strengthening exercises during pregnancy. – take short breaks and avoid long workouts. Extreme caution is required for heavy weight lifting exercises during pregnancy. Sudden stoppage of deep breathing (‘Valsalva maneuver’) during these sessions, could increase blood pressure and reduce blood flow to the fetus. What is the safe upper limit of exercise intensity? There is no safe upper limit for the exercise intensity during pregnancy has been established. This is due to the fact that the exercise endurance is different for every individual. While the same intensity of exercise could be perceived as mild-to-moderate by a trained individual, it could be of high intensity for another person who does not perform regular exercise. The heart rate normally increases during pregnancy (even at rest) due to physiological changes. Therefore, this is not a very good predictor of exercise intensity during pregnancy. A simple method of assessing the exercise intensity during pregnancy is ‘Talk Test’. A pregnant woman should be able to maintain a normal conversation during her entire moderate-intensity aerobic exercise session. If she is out of breath and cannot talk properly, then the exercise is likely to be performing a high-intensity workout. It is your personal perception of the intensity of a physical activity. Borg Rating of Perceived Exertion Scale is a very practical method to assess the workout intensity. For moderate-intensity exercises during pregnancy a Borg rating of 13-14 is desirable. The rating of 20 indicates maximal intensity, whereas 6 indicates no exertion. Why performing exercises during pregnancy could be challenging? About 70% of healthy pregnant women suffer from the symptoms of breathlessness (‘Dyspnoea’), even when they are resting. This happens without any respiratory illness or other health disorder. Women can get breathless very easily during pregnancy at the time of exercise. These symptoms are primarily due to an increase in the minute volume, which is the total volume of air inhaled or exhaled during breathing every minute. The minute volume is increased by about 30% at rest during pregnancy. This is mainly due to the increase in the Tidal Volume (TV), which is the amount of air inhaled or exhaled during each breath (TV increases by 45% during pregnancy). In simple terms, Minute Volume = TV x Rate of breathing per minute (‘Respiratory Rate’). The respiratory rate during a healthy pregnancy remains almost unchanged. During pregnancy, the oxygen requirement of the body increases by 30% to 40%. This gradually rises as the pregnancy advances. This is required to meet the demands of the increased metabolic function of the body (‘Basal Metabolic Rate’). a) the needs of the growing fetus, uterus, and placenta. b) increased function of the heart, lungs and other systems during pregnancy. During pregnancy, the body’s carbon dioxide production increases by about 30-300 ml/minute. This happens due to increased Basal Metabolic Rate of the body. The increased minute volume helps to wash out this excess carbon dioxide gas from the body. – There is a shift in the body’s centre of gravity due to the growing fetus. – The laxity of the joint increases due to hormonal changes. In fact, the injury due to fall is 2-3 times more likely in pregnant women compared to their non-pregnant counterparts. Due to the common pregnancy symptoms (such as nausea/ vomiting and backache), exercise could be challenging. Sometimes she also could suffer from insomnia. As a result, she could be exhausted and tired. She might also develop swelling of the feet (oedema) or could suffer from stiffness/ pain in the wrists (‘Carpal tunnel syndrome’) during pregnancy. They could make joint movement and the exercise difficult. What are some basic tips for exercises during pregnancy? 1. Drink plenty of water before, during and after exercise sessions. This would prevent dehydration. 2. Wear supportive clothing during the exercise session. For example, use a sports bra for supporting breasts and belly support belts for reducing abdominal discomfort (especially in the third trimester). 3. Adopt measures to allow better dissipation of heat. For example, during the exercise wear loose-fitting clothes, avoid exercising in a hot/humid environment, perform exercising in water and/ or exercise in a temperature-controlled room (if the external temperature is high). 4. Listening to the body: to stop when you feel exhausted/ tired. What are the risks/ concerns for exercises during pregnancy? Pregnant women can sustain trauma from contact sports and/or due to the tendency to fall/ postural hypotension. 1) Increased blood flow to the skin surface. 3) Lowering of the set point for the normal temperature of the body. The fetal temperature is on an average 1° C higher than the mother’s core temperature. Therefore, moderate-intensity exercise regime (in normal external temperature) does not increase fetal temperature significantly. When the exercise is undertaken in a hot and humid condition or during high-intensity exercise, the heat dissipation system does not work effectively. This can get worse in presence of maternal dehydration. Dehydration interferes with heat dissipation even further resulting in a further increase in core temperature. As a result, the pregnant woman’s core temperature continues to rise. Consequently, the fetal temperature keeps on increasing. All such studies investigated the impact of fever during early pregnancy. There is no evidence to suggest that transient raised temperature due to exercise during pregnancy is harmful to the fetus. It is usually recommended that pregnant women should avoid exercise at an external temperature exceeding 90°F (32°C). The hydrotherapy pool temperatures should be kept ≤95°F (35°C) if this is used by a pregnant woman. During exercise, the blood flow shifts to the muscles. As a result, there could be a reduced blood supply to the uterus and placenta at the time of exercise during pregnancy. However, the studies have shown that the fetus compensates well to this transient reduction in utero-placental blood flow. There is no evidence to suggest that moderate-intensity exercise during pregnancy predisposes fetus to any risk of hypoxia (lack of oxygen) or causes fetal distress. This is a reason why prolonged strenuous exercise should be avoided in pregnancy. What precautions are to be taken for exercises during exercises? In the supine position, the enlarged uterus puts pressure on the inferior vena cava (major blood vessel in front of the spine). As a result, the return of blood from lower limbs (‘Venous return’) to the heart is decreased. Due to this, the blood pressure could drop (‘orthostatic hypotension’) and the blood flow to the fetus could be reduced. This could increase the risk of injury to the abdomen. Therefore contact sports, such as soccer, karate, boxing, tennis etc. should better be avoided. As the body balance could be disturbed and tendency to fall increases during pregnancy, sports activities with high risk of fall should be avoided. These include gymnastics, skiing, off-road cycling, surfing, and horse riding. Professional pregnant sportswomen involved in those activities should get advice from experienced trainers/ sports medicine specialists. Risk of increased temperature (‘hyperthermia’) which could, in turn, raise the fetal temperature. There is some concern that this could harm the fetus, especially in the first trimester. However, more research is needed in this area. This could worsen the adverse effects of maternal hyperthermia. 3. Avoid ‘Hot Yoga’ and ‘Hot Pilates’. This could result in the formation of the air bubbles in the blood. Babies do not have mechanisms to filter those air bubbles. This could affect the baby by occluding the blood flow to the organs, especially to the lungs (Air embolism). To avoid exercises on the initial 3-4 days of arrival to a high altitude (above 6000 feet). This would allow adaptation to the low atmospheric pressure and reduce the risk of acute mountain sickness. This is an emergency medical condition. They could increase the risk of injury to the joints and chance of fall. Therefore, they should better be avoided, especially for the beginners during pregnancy. When to stop during an exercise session during pregnancy? – Swelling/ pain in calf muscles. – Feeling very tired/ exhausted. What advice should be given to the elite athletes? Pregnant athletes or those involved in competitive sports should get adequate advice from their health care providers, trainers, and sports medicine specialist. This would help them to develop an individualised safe training regime. They should be given information on the impact of high-intensity exercise during pregnancy. It is usually advised not to aim for the maximum pre-pregnancy fitness levels. Is exercise in water beneficial during pregnancy? 1. Pregnant women should be advised to stay active and perform a regular moderate-intensity exercise during pregnancy (unless they have any medical complication where exercise should be avoided). 2. Exercise during pregnancy have several health benefits. This could reduce gestational diabetes and preeclampsia and improves mood, wellbeing, and sleep. 3. Moderate-intensity aerobic exercise during pregnancy do not cause miscarriage, preterm birth/ delivery or fetal growth restriction (‘Small for dates’ baby). 4. There is limited scientific data on the safety of high-intensity exercise and heavy-weight training during pregnancy. They should be avoided for the beginners. For trained professionals, these activities may be continued with some modifications. However, it is always advisable to seek advice from healthcare providers/ Trainers/ Sports Medicine specialists. 5. Physical activities to be avoided during the pregnancy are contact sports, high impact exercises, Scuba and Sky Diving, ‘Hot Yoga’ and ‘Hot Pilates’. 6. Heart rate measurement is not a good indicator of exercise intensity during pregnancy (as maternal heart rate increases during pregnancy). Perception of intensity and Talk Test are simple and practical ways to assess the intensity. 7. Exercise could lead to a rise in maternal body core temperature (‘Hyperthermia). Hyperthermia (especially from fever due to illness) is thought to be harmful to the fetus, especially in the early pregnancy. However, exercise-induced transient hyperthermia is not known to be harmful. Still, it is advisable to take measures to dissipate heat effectively during exercise during pregnancy. 8. For pregnant women with no medical complication and no contraindications for exercise, the recommended activities should include a combination of both aerobic exercises (total of 150 minutes per week) and muscle strengthening exercises (8-12 repetitions at least twice per week). 9. There is no established safe upper limit of exercise intensity during pregnancy. Pregnant women are advised to listen to their bodies and avoid over-exerting themselves. 10. Performing exercises should be stopped if there are any medical/ pregnancy complications, such as chest pain or vaginal bleeding, leaking amniotic fluid or signs of labour. 11. There are some medical conditions where exercise during pregnancy should be avoided, such as fever, active vaginal bleeding, placenta previa, ruptured amniotic membrane, fetal growth restriction, high risk of miscarriage (such as cervical incompetence), high risk of preterm labour and high blood pressure. 2. Robson SC, Dunlop W, Boys RJ, Hunter S. Cardiac output during labour. Br Med J (Clin Res Ed) 1987;295:1169–72. 3. Bonds, D., & Delivoria-Papadoupoulos, M. (1985). Exercise during pregnancy. Potential fetal and placental metabolic effects. Annals of Clinical and Laboratory Science, 15(2), 91-99. 4. Soultanakis, H.N., Artal, R., & Wiswell, R.A. (1996). Prolonged exercise in pregnancy: Glucose homeostasis, ventilatory and cardiovascular responses. Seminars in Perinatology, 20, 315–327. 5. Milunsky, A. et al. (1992). Maternal heat exposure and neural tube defects. Journal of the American Medical Association, 268, 882–885.